Last weekend my wife came home with Rabbit and asked if I was interested in preparing something on the barbecue with it. Does she know how to make me happy? No doubts about that! I have many ideas for rabbit but these rabbit breasts (I think) were perfect for stew. That’s how this “Beer braised Rabbit stew with Figs” was born. 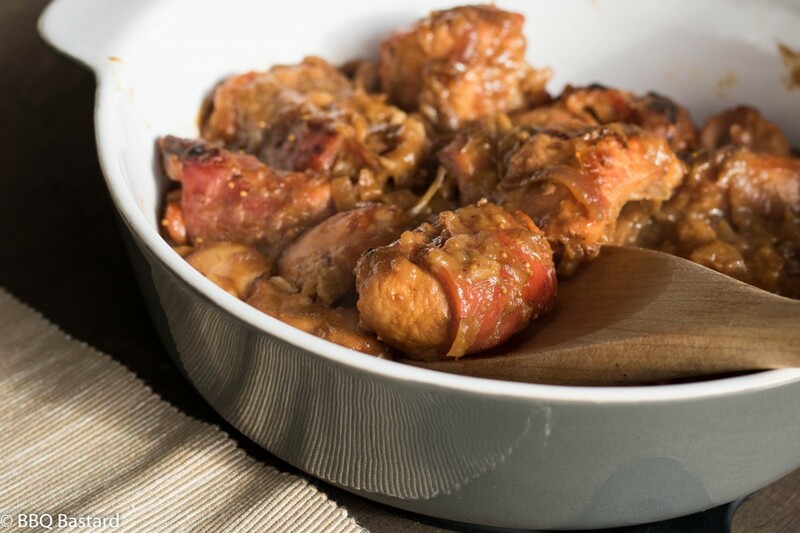 The inspiration for this recipe came from a traditional belgian stew recipe called “Konijn met pruimen” or in english “Rabbit with prunes”. Every belgian household has a grandma preparing this dish with love! It’s traditionally served with “Belgian fries” (not french they stole them…) and apple sauce. And not to forget the most important of all: “Ne goen”, literally translated: “A good one” pointing at a good beer. Why? For two reasons. First of all it’s a great match with this stew since the beer is used to braise the rabbit. But most of all: “Because we have some beer to be proud of, so why don’t drink it with a decent meal?”. By now I think you’re starting to wonder why the hell I’m constantly talking about “Rabbit with Prunes” while referring to figs and rhubarb in the title? 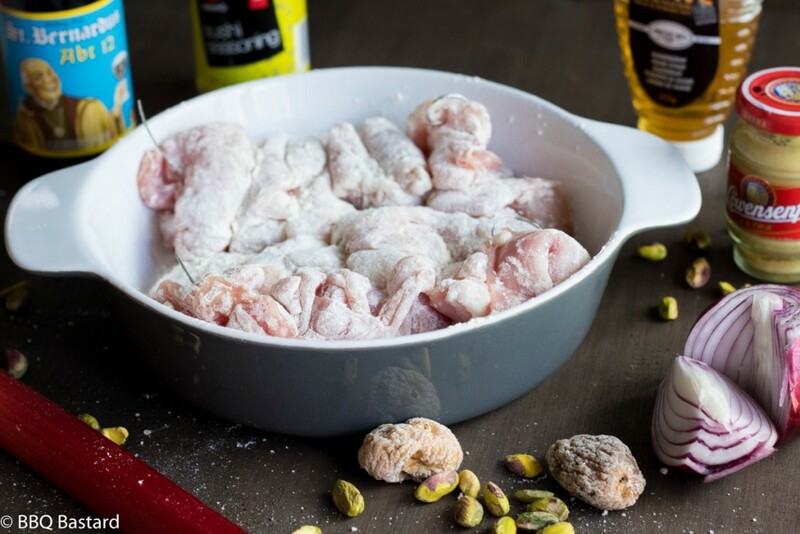 If not… skip to the recipe and start cooking. Otherwise you might read on. It’s not such a big deal after all… We simply had no dried prunes at home. Since they were the only ingredient missing and figs and rhubarb were in the picture for the other recipe options we had in mind. So why not combine them and save us a trip to the store? They must be as good as prunes I thought and decided to give it a go. 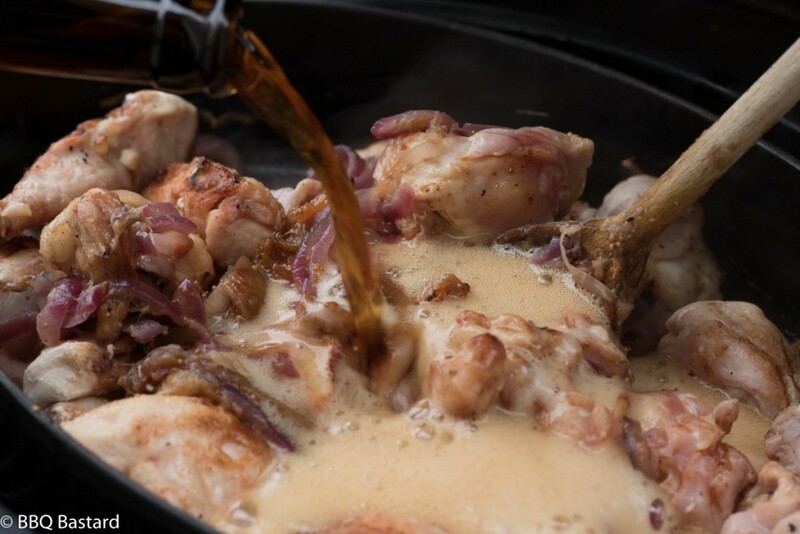 The Figs bring some sweetness while the rhubarb takes care of the sour you need to balance the flavours in this Beer braised Rabbit. How did it taste? I could be humble and say it was ok… But my wife always “complains” I’m always too excited when I make something I’m happy about. So using my own words might not be right either (but who cares I think it was delicious). Maybe it is safer to say what she thought about it? Well, correct me dear if I am wrong (I know you will), she loved it. If you’re my wife and think I’m lying over here, feel free to comment below. If you have some questions about this recipe or have an own version to share, please feel free to do the same 😉 In case you loved the recipe I hope to see you connect on social media. Thanks for reading! 1. Prepare your BBQ for direct grilling over hot fire. 2. Spice the meat with stew rub and sprinkle them with flour. 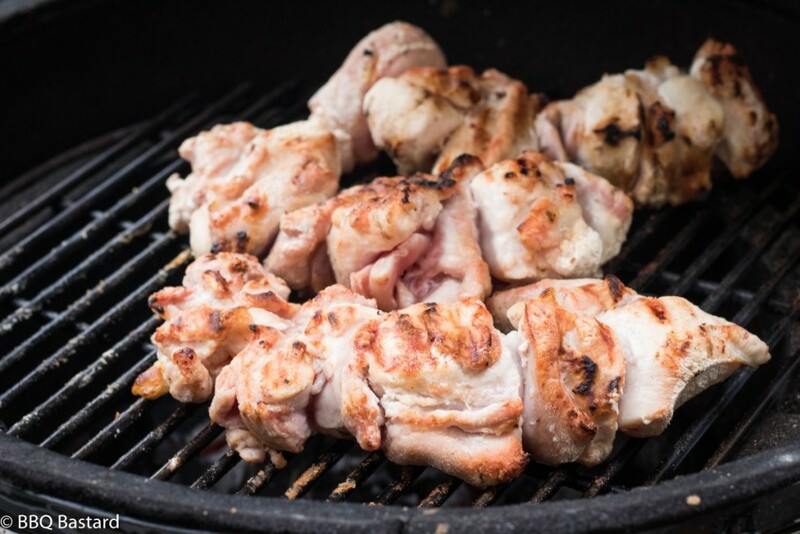 Thread the rabbit meat over skewers and place them over the hot coals until they're golden brown. Put aside. If you use bone in rabbit you cut the rabbit in +- equal parts and rub them with the stew rub and flour. You don't need to skew them for grilling. 3. Tame the fire to a low/medium heat. 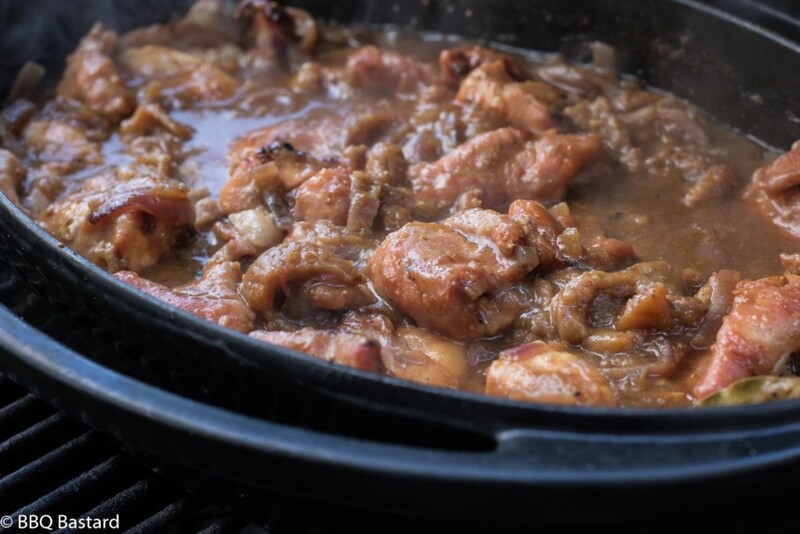 Put a large skillet or dutch oven on the BBQ and add a tbsp. of Ghee. 4. Once the ghee is molten, add the sliced red onions and 2 tbsp. agave syrup. Let cook until the onions are nicely caramelized. 6. Smear 2 slices of bread with the spicy mustard and put them on top of the stew (mustard side down). 7. Let the stew simmer for 1-2 hrs. You need the sauce to bind but check the meat regularly to make sure it's not overcooked. 8. Finnish the stew with a dash of sushi vinegar (at taste) and some pistachio nuts (optional since I forgot to add them). 9. 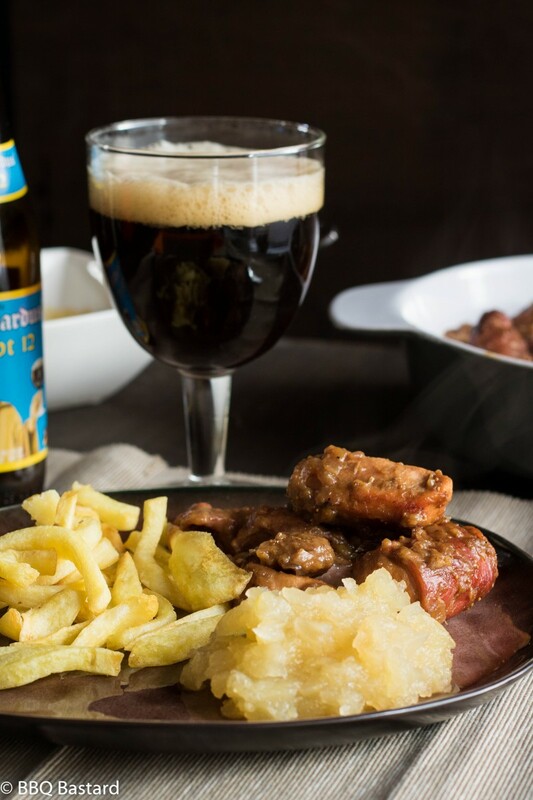 Serve with fries and a good beer to have a delightful belgian inspired meal.